Note that it is very unlikely that the names of files (James +, Roger) will be the same as in this error message. You deleted a natal chart that was used by a synastry chart, and the associated synastry chart wasn’t also deleted. When a natal chart is deleted all synastry charts with that associated chart are automatically deleted – or at least that’s what is supposed to happen! Note that a synastry chart database record only holds the name of the associated natal charts. So when a synastry chart is selected it looks in the Your Charts database for the associated natal charts. 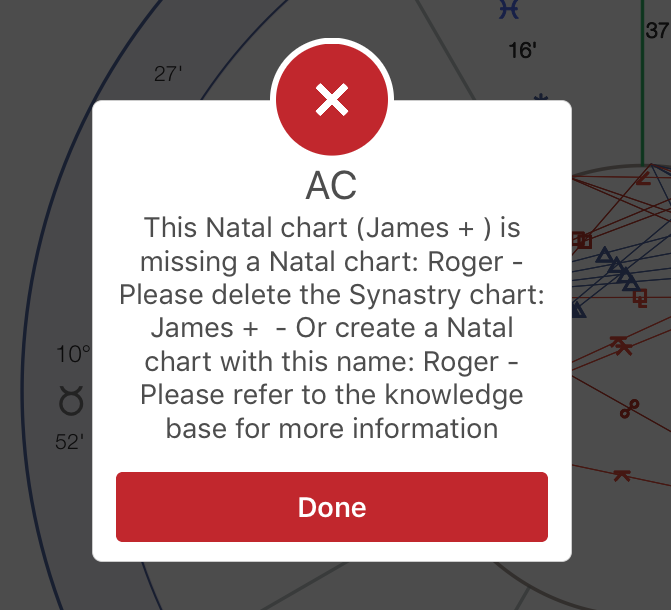 If the associated synastry chart wasn’t deleted (due to some problem) then an error will occur when AC looks for it when loading a synastry chart with a reference to that natal chart. Why? Because it can’t find it and it expects to do so. When an error like the above happens a recovery procedure is activated AC. This involves loading the chart that has been marked as Autoload. In most instances, this will be the natal chart of Aaron Spelling from the provided charts. Delete the offending synastry chart. Go to the Chart List (see below for screenshot) and delete from there. Create the missing natal chart using the exact name as stated in the error message. This should solve any more errors relating to that particular synastry file. Left swipe the problem chart record and tap Delete.